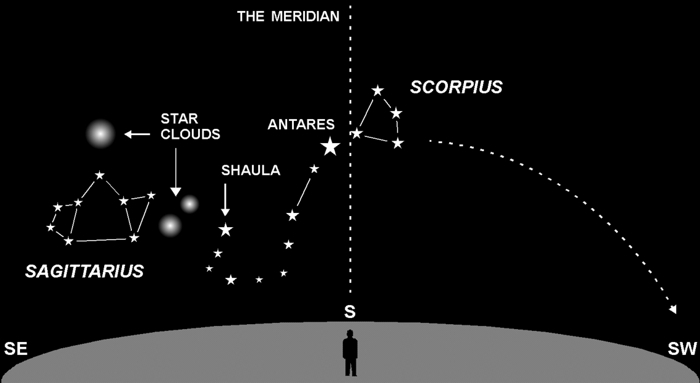 We note Scorpius is “on the meridian” since that’s its point of highest elevation and best visibility. The meridian, an imaginary line, runs from north to south across the dome of the sky. If you follow Scorpius into the later hours of the night, you’ll see it crawling downward along the dotted path. The scorpion will set in the southwest around 5 am. Sagittarius, by contrast, looks nothing like its namesake (The Archer). Most of the stars in this constellation are too faint or too low to be easily seen. What you can see is “The Teapot,” an asterism, or subset, of its brighter stars, some from the archer’s bow, others from his body. If you have access to binoculars, check out the area just above the teapot spout. To the naked eye, it looks like puffs of steam. Using even inexpensive binoculars, the “steam” is seen to be several rich clusters of beautiful multicolored stars. I am always wondering what a meridian is when I use my almanac to garden. Now I know and can look up as well as at my garden. Thank you.